I was not into this whole idea when this year started. For apparent reasons, the ordeal of having a clingy newborn baby makes me want to ignore the things I regularly do to nurture my soul. Also, I didn't feel like having just a word rule my year. "Who knows what the future holds" was kind of my mantra since the arrival of our new baby, Samantha a month ago. Savoring the moment, yes? But when I saw my post about my 2017 one word, I realized how it truly helped me live the year. It served as my guide. Won't go into all the gory details, though. Let me just say that I now have more than 80% humility than I had in 2016. Getting wiser as the years go by, I suppose. So even if I didn't feel like doing this, my past one word post motivated me to do it again in the hopes that the word will reflect the life that I want to live. 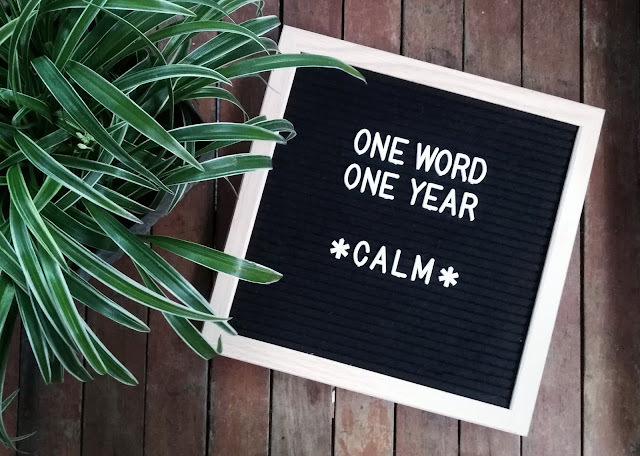 This year, I choose CALM. What better word to pick if you are a sleepless mom who has a tiny princess that poops and cries and gets hungry at 2 am? To make it harder for the mom, she has to be up before 4 to prep for a bigger princess who goes to school. That other princess, by the way, is in her pre-teen years, a complicated stage in a human's life. Those early morning complications sometimes make the mom's entire day complicated... enough for her to get a horrible headache. Breathe in, breathe out. Hope with me that I'd get to live my one word this year and beyond.